As soon as we came in we were welcomed very professio As we came in we were welcomed as you would expect, cheap and cheerful food great staff what more can you ask for !! 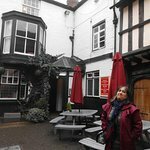 We stumbled upon this place looking for decent pub food whilst visiting Shrewsbury. The food was really good and priced at 2 meals for 10 pounds which given the quality was quite outstanding. Would definitely recommend (especially the pie)! had a drink here sat 11th april, busy walk round place not a relaxing place to find a seat for the evening, and it Stinks of rotten baby food there was an all over fusty rotten food smell ???? Get quick answers from Old Post Office staff and past visitors.